looking back to the 2016-2018 biennium we all can be very proud. We got excellent results in contributions to the Zonta International Foundation and have been honored at the International Convention in Yokohama with the “Foundation Recognition Award” as one of the top three districts. Thank you so much for this great improvement! Additionally, we have received the „Membership Recognition Award“ as one of only five districts with membership growth. This is outstanding, too! Serving as your Governor has been an honor and a great pleasure! I enjoyed the encounters with you at the meetings in your areas, at the District Conference 2017 in Dortmund and at the fantastic convention in Yokohama/Japan very much. I am looking forward to meeting you again, soon. All the best for you and your club in this biennium! The next District Conference will take place in Eindhoven (NL), October 4-6, 2019. The last District Conference was in Dortmund, October 6-8, 2017. 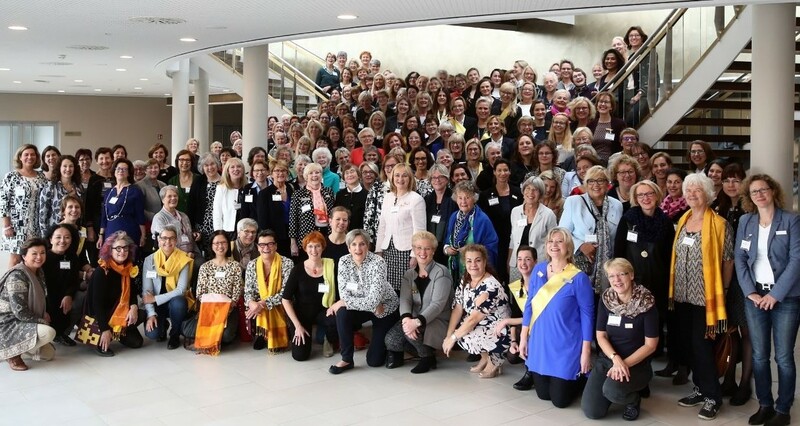 The look of Zonta International changed in 2015. Proper use of the Zonta brand will ensure a consistent, current image throughout any references. Please familiarize yourself with our current brand identity found in our guidelines in the document to the right. Join the campaign to end violence against women. Support ZONTA. Become a member!